Each B-vitamin fills a different, complementary, need, which is why they should usually be taken together. The optimum amounts of vitamin intake vary with gender, age, and genetic make-up. These amounts are not known, but are likely in many cases to be much higher than government-chosen RDAs (Recommended Daily Amounts). Recent research suggests that vitamins B-6, B-12, and folic acid prevent specific kinds of DNA damage that can elevate cancer rates and accelerate the aging of tissues. Low B-6, B-12, and folic acid levels also cause increased blood levels of homocysteine, which in turn contributes to atherosclerosis, heart disease, and Alzheimer’s. Since B-vitamins are essential cofactors in metabolism and can induce the production of metabolic enzymes, people with inherited inefficiencies in these enzymes may benefit from increased consumption of these vitamins. 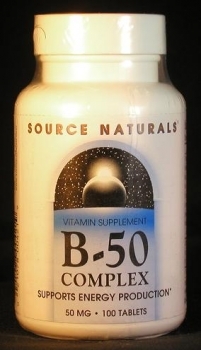 The formula used in our B-50 Complex is intended to provide the B-vitamins in amounts far greater than the RDA while staying within ranges known to be safe. The formula includes two essential non-vitamins (choline, inositol), and an amino acid (PABA) that is suspected to be a dietary essential.